Mary Neubauer of the Iowa Lottery explains the new Monopoly Millionaire’s Club game. Iowa is joining with a majority of states across the country for the release of a new $5 lottery game. Iowa Lottery spokesperson Mary Neubauer says sales for the game, called Monopoly Millionaires’ Club, will begin on October 19. “The interesting thing about this game is that it offers players three chances on each ticket to win a prize of at least $1 million — through a weekly lotto drawing, through a separate drawing triggered only when the game’s top prize is won in the lottery drawing, and on a nationally televised game show,” Neubauer says. 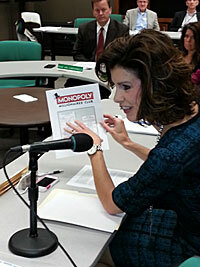 She discussed the details of the new game at a meeting of the Iowa Lottery Board today in Des Moines. Neubauer says Monopoly Millionaires’ Club should attract players who’ve requested games that offer big prizes to multiple winners. “Rather than just seeing one or two people take home the $500 million, they’d like to see more people share in the wealth, so that’s what this game is designed to do,” Neubauer said. 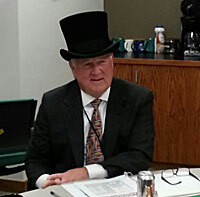 Iowa Lottery CEO wears a top hat to promote the new Monopoly-themed game. The game will involve a weekly lotto drawing, Fridays at 10:15 p.m. (CST), with the top prize starting at $15 million. That top prize can roll without being won three times to a maximum of $25 million. It’ll remain capped at $25 million until there’s a winner, which opens a separate drawing for one-million dollar prizes. Each ticket a player purchases includes a “property” that’s similar to the Monopoly board game. Once a player forms a complete property set, they can enter a drawing for a chance to win a trip to Las Vegas and possibly become a contestant on the national TV game show. That show will make its debut in February 2015. The Iowa TV stations that will carry the show will be announced at a later date.